This is a tutorial for how to use Hidden Markov Models (HMMs) in Haskell. We will use the Data.HMM package to find genes in the second chromosome of Vitis vinifera: the wine grape vine. Predicting gene locations is a common task in bioinformatics that HMMs have proven good at. The basic procedure has three steps. First, we create an HMM to model the chromosome. We do this by running the Baum-Welch training algorithm on all the DNA. Second, we create an HMM to model transcription factor binding sites. This is where genes are located. 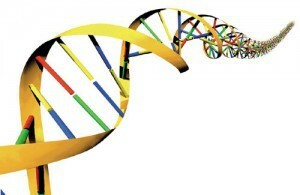 Finally, we use Viterbi’s algorithm to determine which HMM best models the DNA at a given location in the chromosome. If it’s the first, this is probably not the start of a gene. If it’s the second, then we’ve found a gene! Unfortunately, it’s beyond the scope of this tutorial to go into the math of HMMs and how they work. Instead, we will focus on how to use them in practice. And like all good Haskell tutorials, this page is actually a literate Haskell program, so you can simply cut and paste it into your favorite text editor to run it. Notice that states and events can be any type supported by Haskell. In this example, we will be using both integers and strings for the states, and characters for the events. DNA is composed of 4 base pairs that get repeated over and over: adenine (A), guanine (G), cytosine (C), and thymine (T), so “AGCT” will be the list of our events. >hmm2 = simpleHMM [1,2] "AGCT"
hmm2 is an HMM with the same states and events as hmm1, but all the initial, transition, and output probabilities are distributed in an unknown manner. This is okay, however, because we will normally want to train our HMM using Baum-Welch to determine those parameters automatically. Now, how do we train our model? The standard algorithm is called Baum-Welch. To illustrate the process, we’ll create a short array of DNA, then call three iterations of baumWelch on it. >dnaArray = listArray (1,20) "AAAAGGGGCTCTCTCCAACC"
We use arrays instead of lists because this gives us better performance when we start passing large training data to Baum-Welch. Doing three iterations is completely arbitrary. 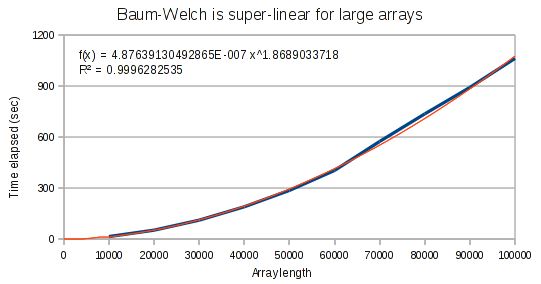 Baum-Welch is guaranteed to converge, but there is no way of knowing how long that will take. NOTE: Whenever you use loadHMM, you must specify the type of the resulting HMM. loadHMM relies on the built-in “read” function, and this cannot work unless you specify the type! Great! Now, we have a fully trained HMM for our chromosome. Our next step is to train another HMM on the transcription factor binding sites. There are many advanced ways to do this (e.g. Profile HMMs), but that’s beyond the scope of this tutorial. We’re simply going to download a list of TF binding sites, concatenate them, then train our HMM on them. This won’t be as effective, but saves us from taking an unnecessary tangent. >          loadTF = liftM (filter isValidTF) $ (liftM lines) $ readFile "TFBindingSites"
So now we have 2 HMMs, how are we going to use them? We’ll combine the two HMMs into a single HMM, then use Viterbi’s algorithm to determine which HMM best characterizes our DNA at a given point. If it’s hmmDNA, then we do not have a TF binding site at that location, but if it’s hmmTF, then we probably do. The Data.HMM library provides another convenient function for combining HMMs, hmmJoin. It adds transitions from every state in the first HMM to every state in the second, and vice versa, using the “joinParam” to determine the relative probability of making that transition. This is the simplest way to combine to HMMs. If you want more control over how they get combined, you can implement your own version. Finally, our main function runs findGenes with several different joinParams. These act as thresholds for finding where the genes actually occur. You can download the full results here. Everywhere where there is a 2, Viterbi selected hmmDNA; where there is a 1, Viterbi selected the hmmTF. Whether you select this area as a likely candidate for a transcription factor binding site depends on how you set your join parameter. Now that you’re familiar with how the Data.HMM module works, let’s look at its performance characteristics. Overall, the Data.HMM package performs well on medium size datasets of up to about 10,000 items. Unfortunately, on larger datasets, performance begins to suffer. Algorithms that should be running in linear time start taking super-linear time, presumably because Haskell’s garbage collector is interfering. More work is needed to determine the exact cause and fix it. Still, performance remains tractable on these large datasets up to 100,000 items, which is the largest I tried. I ran these tests using haskell’s Data.Criterion package. Criterion conveniently allows you to define multiple tests and does all the statistical analysis of them. For these tests, I did 3 trials each, and ran them on my Core 2 duo laptop. The code for the tests can be found in the HMMPerf.hs file. In all graphs, the blue line is actual performance data and the red line is a best fit curve. 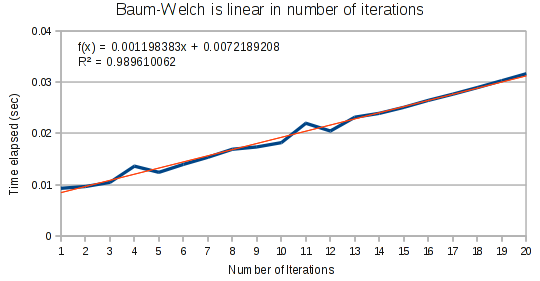 First, as expected we find that Baum-Welch runs in linear time based on the number of iterations. In an imperative language, there would be no point in even testing this. But in Haskell, laziness can rear its head in unexpected ways, so it is important to ensure this is linear. 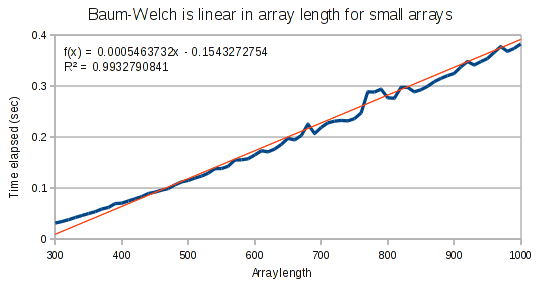 For small arrays, Baum-Welch runs in linear time. 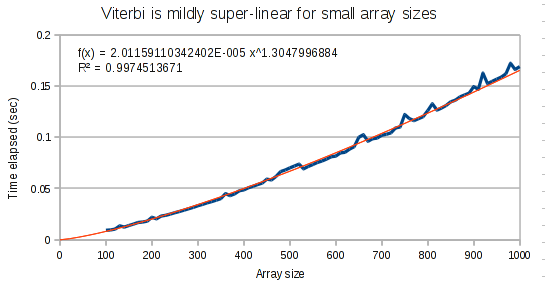 But for larger arrays, it runs in super-linear time. It is interesting that the exponent on our polynomial function is not quite at 2. This provides evidence that the performance hit has to do with the Haskell compiler and not an incorrect implementation. 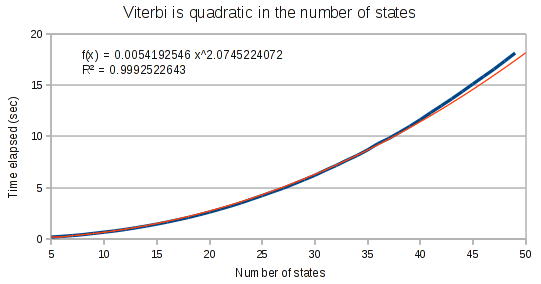 As expected, the Viterbi runs in quadratic time on the number of states in the HMM. 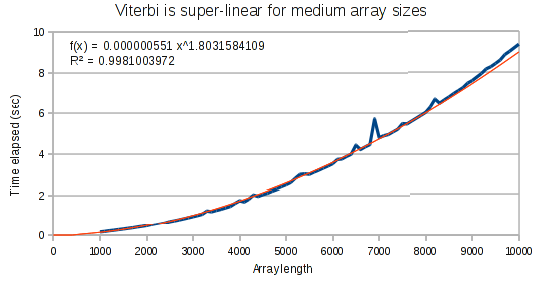 The curves for the Viterbi algorithm clearly demonstrate that something weird is going on. 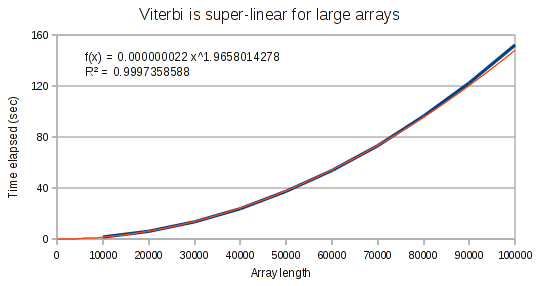 At small array sizes, Viterbi is only mildly super-linear. It’s best fit polynomial curve has an exponent of only 1.3. But at medium array lengths, this exponent increases to 1.8, and at large array lengths, the exponent increases to 1.97. Data.HMM is a great tool if you just need a small HMM in your Haskell application for some reason. If you’re going to be making heavy use of HMMs and don’t specifically need to interact with Haskell, it’s probably better to use a package written in C++ that’s been optimized for speed.